Philadelphia District Attorney Larry Krasner announces charges against two men in the shooting of Philadelphia Police Officer Paul Sulock, in a news conference Nov. 9, 2018. Two men were charged Friday for allegedly shooting at and wounding a Philadelphia police officer this week in Kensington, District Attorney Larry Krasner announced at a news conference at his Center City office. Jerome Hill, 29, and James Gauthney, 19, were in custody Friday afternoon in the assault on Officer Paul Sulock, who was shot in a leg when he and his partner came across what police have described as a prelude to a shooting at G and Madison Streets just before 11 a.m. Wednesday. Krasner said video footage showed Hill using a gun to hit someone else before Sulock and his partner arrived. 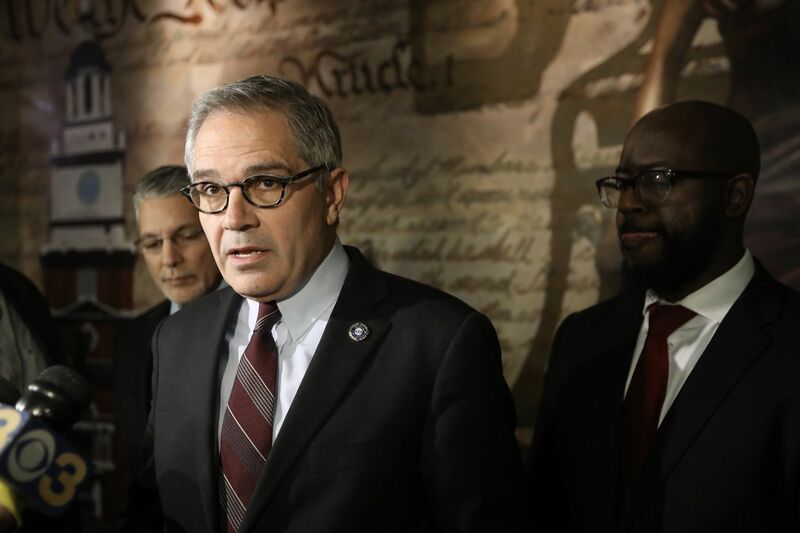 At that time, Krasner said, the officers tried to get the incident under control, but video shows Hill turning toward the officers and shooting at them. "I think it is extremely serious when anyone brandishes a weapon on the street — but how much more serious when police arrive on the scene to make peace, and you turn and fire at them," said Krasner, who described the officers' actions that day as "heroic." James Gauthney, left, and Jerome Hill are charged in the shooting of Philadelphia Police Officer Paul Sulock. Hill faces two counts of attempted murder, two counts of aggravated assault on law enforcement, and related charges, according to court records. His bail was set at $3.3 million. Gauthney, of the 6200 block of Crittenden Street, East Germantown, was charged with hindering apprehension, obstruction of justice, and related counts. Krasner did not detail Gauthney's involvement but said prosecutors would request bail of $1 million. The investigation was ongoing and could include additional defendants, Krasner said. Hill, of the 500 block of East Fisher Avenue in Olney, and Gauthney have extensive criminal records, according to court documents. In 2012, Hill was sentenced to four to eight years in prison after he pleaded guilty to several weapons charges, the records say. In 2009, he pleaded guilty to aggravated assault and weapons charges, earning a five-year probation sentence after serving up to 23 months behind bars. He was charged twice before — in 2007 and 2009 — with attempted murder, the records say, but both cases ultimately were dropped. In the earlier case, records show, a complaining witness twice failed to appear in court and prosecutors withdrew the charges. It was not immediately clear why the second case was dismissed. Gauthney, meanwhile, was due in court next week for two drug-related matters: a sentencing Tuesday, and the beginning of a trial in another case Wednesday. He also was scheduled to face another drug-related trial in January, court records show, and he was arrested twice more in 2018 for drug-related charges. One case was dismissed, the records show, and prosecutors had been attempting to refile a criminal complaint in the other. The circumstances of that case were not immediately clear Friday evening. Gauthney had appeared in court as recently as Oct. 30 for a status listing in one of his ongoing matters, according to court records. Krasner declined to comment on any prior cases involving either defendant. Police Commissioner Richard Ross said Sulock, 31, a 10-year veteran of the department assigned to the 24th District, was shot in the right thigh but managed to chase and apprehend one of the suspects after he was struck. Krasner declined to say whether Sulock had apprehended Hill, Gauthney, or someone else. Sulock was taken to Temple University Hospital after the shooting and was released Thursday afternoon. John McNesby, president of Fraternal Order of Police Lodge 5, said Friday that Sulock — a father of four and the son of a city cop — was in good spirits and overwhelmed by the support of his family, friends, and fellow officers.